It seems as though most new toys are primarily passive entertainment devices. My grandchildren’s rooms are filled with toys that sing, dance or scoot across the floor and they came that way right out of the box. All the kids or their parents had to do was insert batteries and flip a switch. That may be fine for the little tykes, but I would like to see the older kids have a toy that would let them create something straight from their imagination. That’s why I bought a set of IMDEN Magnetic Building Blocks for 7-year-old Luke. They have more tech appeal than the snap-together blocks he played with as a toddler with just enough technology to be a big boy’s toy and the ability to put engineering concepts within his grasp. The IMDEN set comes with 92 block pieces in square, triangle, and hexagonal shapes. The pieces have embedded magnets that allow them to be easily snapped together to make a virtually unlimited number or geometric shapes. You also get two sets of wheels on platforms and a pair of towers that can be used to build a Ferris Wheel, among other things. 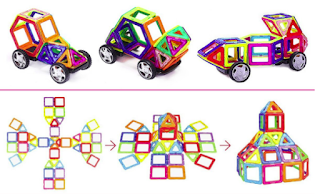 For ideas, there’s a 30-page booklet that contains pictures of more than two dozen creations along with step-by-step instructions to build a car, a helicopter, a penguin and lots of other objects. The magnets allow the pieces to easily join each other. 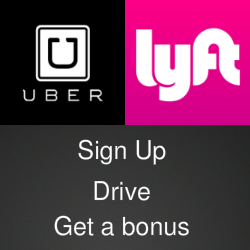 You can make an elongated rectangle to serve as a tail or a submarine body, or a build a pyramid for a nose or a dome. The magnets shorten the time between inspiration and completed project and and make revisions a snap, literally. I dropped off the blocks at Luke’s house, then checked back with him a week later to see what he could do with them. He immediately grabbed the wheels and showed me how to build what he called an “animal car” — a Transformer-style vehicle — that he whipped up in about two minutes. You can watch him at work in the video below. On another occasion, his friends tackled the rotating wheel with only minimal assistance from the instruction. And the girls in the group seems to especially like the letter and number panels that snap into the square blocks, allowing them to name their creations. I liked the sling bag that comes with the blocks set. It makes clean up easy and keeps all the loose pieces in one place. But most of all, I liked how the blocks let Luke gave his active imagination an easy and rewarding outlet. 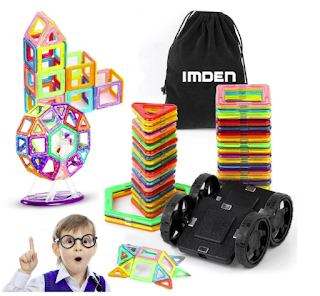 The IMDEN Magnetic Building Blocks are priced at $29.99 and are available on Amazon.